Terex crawler crane ... “customer’s first choice”. Aertssen Machinery Services Middle East based in Doha, Qatar, has taken delivery of a Terex CC 2400-1 lattice boom crawler crane. An existing Terex customer, the company specialises in heavy lifting and transport and the crane will be used mainly in the oil and gas and construction sectors. This latest addition to the Aertssen fleet has a maximum lifting capacity of 400 tonnes and a maximum load moment of 5,168 tonne metres. 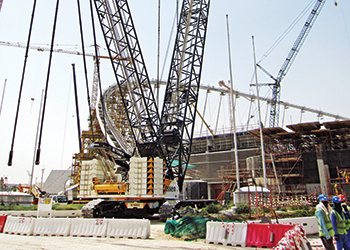 Equipped with main boom, luffing jib and Superlift, the CC 2400-1 is one of the most powerful cranes in its class. US-based Terex Corporation is a lifting and material handling solutions company specialising in five business segments – aerial work platforms, construction, cranes, material handling and port solutions and materials processing.